Here's a fantastic recipe that I want to share with you, simply because I refer to it quite often in my Instagram posts. And so many of you have asked for it, so I thought I'd just post it on here for your reference. The recipe is originally from Hanna, and I've just made minor changes to suit my own tastes. I've tried these with many different kinds of gluten-free flours, and so far all of them worked fine. My favorites are buckwheat, teff and sorghum. 1) Preheat the oven to 225° C (440° F) and line a baking sheet with parchment paper. 2) In a bowl, mix all dry ingredients. Add the hand beaten eggs, plant milk of choice and apple cider vinegar and stir with a wooden spoon (or similar) until well mixed. 3) Add the firmly beaten egg white and leave the dough to set for a few minutes. Divide the dough into 6 equally big pieces and form them with wet hands (otherwise the dough will stick) into bagel-like shapes, and place on baking sheet. 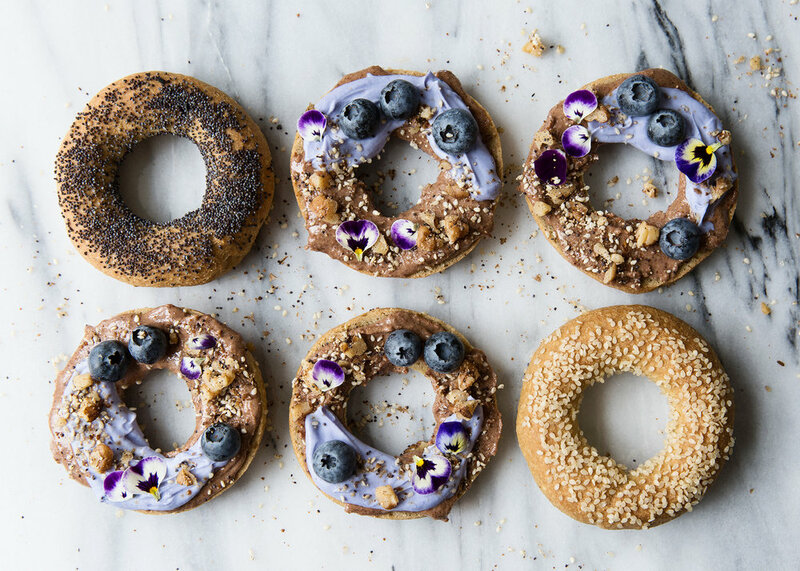 You can use a donut pan if you like, or place a small silicone muffin mould in the middle of each bagel to help it keep its shape while baking (optional). 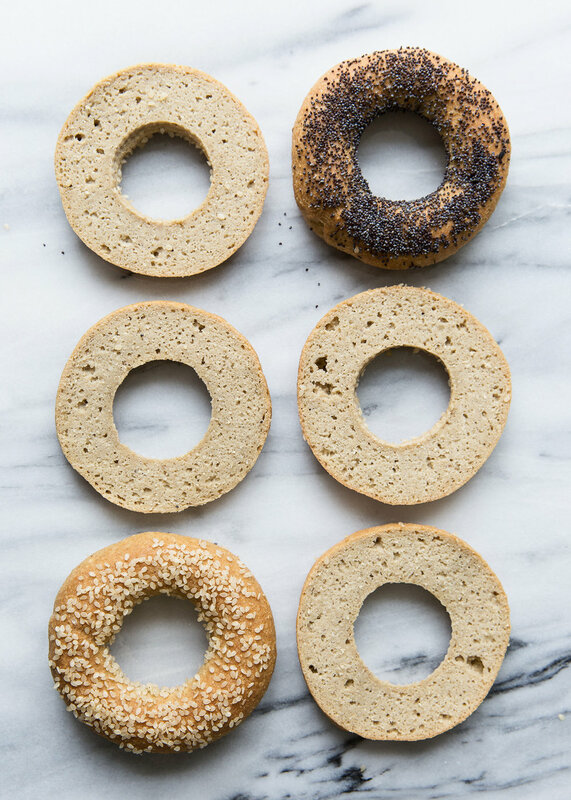 4) Sprinkle your bagels with seeds of your choice and bake on the middle rack in the oven for about 25 minutes. Let them cool on a cooling rack before eating. Note! The bagels keep well in the fridge for a couple of days, but I prefer freezing mine to make them last longer. They can be stored in the freezer for at least 3 months. 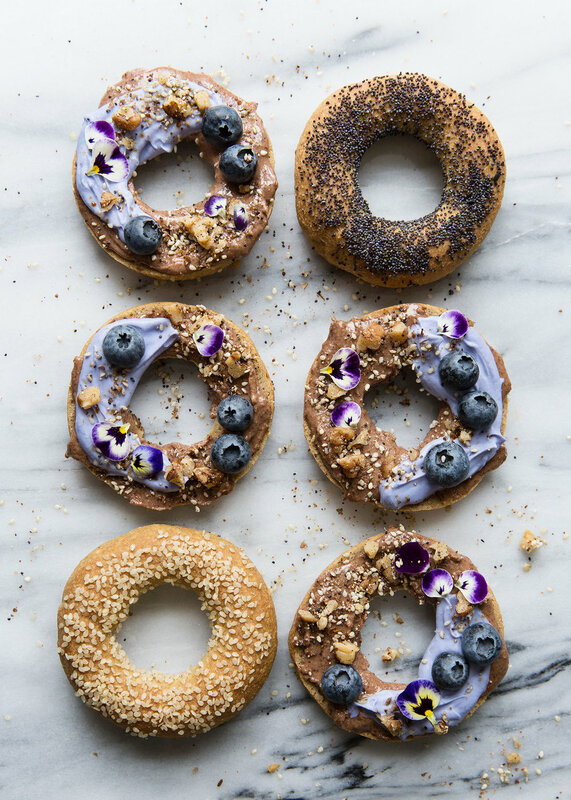 Gluten-free bagels topped with almond butter, coconut yogurt (dyed with butterfly pea powder), a sweet dukkah, blueberries and pansies.